1 in 5 Optimus Primes Bought Online is Fake! According to a news article about fake goods on the UK based business site The Independent, a report made by NetNames states that one out of five Optimus Prime Transformers bought over the internet is a fake. A knock off, from an original to press costs, but made in various stages of quality. "According to the online brand protection specialist NetNames, one in five Transformers Optimus Prime Autobots offered over the internet – tipped to be one of this year's top selling gifts – are cheaply made fakes made in the Far East, with wide variations in quality. One trader based in Hong Kong was responsible for one in 10 of all products offered, according the NetNames". Seibertron's own Scaleface has come across an interesting new listing for a functioning Wristwatch version of the Real Gear figure Meantime. While certainly not the first version of a real working Meantime, this is the first version that seems to have been put into mass production. It would also appear to be the first Knock Off of Meantime as well. To check out the listing, please click here. Continuing on from our earlier reports on a Knock variant of G1 Metroplex, Agesthreeandup.com have posted a new image of their soon to be shipping KO G1 Metroplex in box. The manufacturers of the KO G1 Metroplex have chosen to use a "Free Glow in the Dark Poster" version of G1 Metroplex's box, so it may make it easier to spot which versions of G1 Metroplex are real and which ones are Knock Off's. To check out the image, please click here. To check out the Agesthreeandup ordering page, please click here. It seems as though the sudden influx of lower quality Knock Off G1 Toys is still going strong, with two more Knock Off's spotted on Ebay. Luckily it will be very easy to tell true G1 Cosmos from this Knock Off variety, as the Knock Off labels Cosmos as a "Spase Ship". But be warned, unlike some Knock Off's that are listed as Knock Off's both Cosmos and Powerglide are being listed as "Re-issues". It seems that the Knock Offs are coming thick and fast, just in time for the holiday season. Once again Skywarp gets no love. These figures stand at about 4-5 inches tall in robot mode, and apparently do contain small amounts of die-cast metal. So keep an eye out, for these KO's like many before them will more than likely be listed as "vintage Transformers". 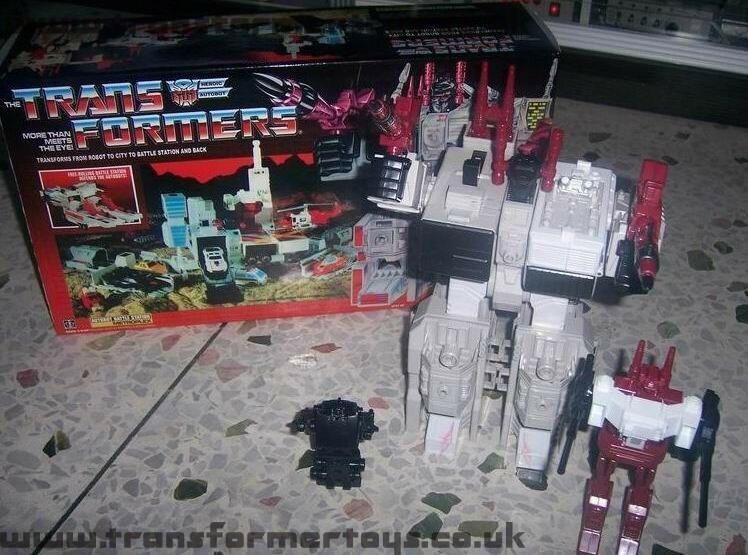 Following on from the earlier reports about a KO G1 Metroplex, the first image of the KO has been posted at TF@TM. To see the Image of the KO Metroplex, please click here. So I just got some good/bad news this evening, depending on how much of a supporter you are. We are going to be bringing in a limmited number of these to try out and can be preordered from our site at $109.99, saving $15 on this trial run. These will be shipping to us early to mid December so we hope to have these all out for the Holidays. As of late, there have been a number of G1 knock offs being produced. It appears that the latest G1 KO to be produced will be G1 Gnaw. Our own Lapse Of Reason has posted a link to an ebay auction that gives us the first look at the KO. I have just been informed from my friend in HK that G1 Dinobot Slag and Sludge are the next in line to be reproduced using G1 US packaging and documentation hot on the heels of Mirage and Wheeljack and Swoop and OP earlier in the year and others in years past (cassettes and minibots). Please be weary of all MISB auctions for G1 Us boxed Slag and Sludge in the near future on eBay. Please ask for images of the tape seals to confirm if it is a true G1 figure. The main difference will be possible yellowing of the tape on the true G1 box and the fact that the G1 tape was not as wide as the tape used on these repros to seal the flaps. Another possible difference might be a glossier look on the repro box vs the G1 box. Other than that these are very good quality repros that may fool you in an auction if it is not stated by the seller. So please be wary if you are hunting for these figures, if something seems too good to be true, it more than likely is.